Drought, flooding and ocean acidification. Unanticipated for 65 million years. All result from climate change according to over 700 of your fellow scientists. So I was wondering whether you thought climate change could be an issue that could unite us all – on left and right – moving us beyond debates about c16 to discussions at the UN Katowice next month where perhaps humanity might finally discover its global map of meaning? Jordan Peterson provides a very succinct answer. Gallery | This entry was posted in Atmospheric Science, Books, Earth, Economics, Fossil Fuels, Science. Bookmark the permalink. The question/statement by the audience member is as asinine and entitled as they come, which is why the response is all the more delicious. When a solution is referenced to a neutral 7.0 pH – values above are alkaline/basic and become more or less alkaline/basic, values below are acidic and become more or less acidic. The ocean’s pH is about 8.1. That’s alkaline. Variations are more or less alkaline, not more or less acidic. The obvious reason for incorrectly using the term “ocean acidification” is a propaganda gambit to scare the gullible and uninformed who associate acid with bad, like alien blood and spit. A solution goes from pH 0.0, dangerous acidity, to pH 7.0, neutral/safe, to pH 14.0, dangerous alkalinity. pH is chemical shorthand for the negative logarithm of H+ ion concentration. With a log function every whole number change is by a power of 10, a factor of 10. A change in pH from 9 to 8 means the H+ concentration increases by a power/factor of 10 or 1,000%!!!!!!! Makes the 25% look pretty trivial – which anything in ppb is. 0 pH to 14 pH is 14,000 %!!!! Applying percentages to a logarithmic scale/function is very dicey, but that’s what you get when food and life style editors write science articles. So, pH 8.1 is moving a YUGE 1 ppb in the direction of slightly more neutrality from pH 8.2 which is not much to begin with. Improperly using the term ocean “acidification” to scare the public over bogus CAGW is a disgrace to science. Spit out the Kool-Aid and grow a backbone. Environmental activism spread quickly (today there are more than 26,000 environmental groups on the U.S. alone. Alarmist politics followed, but soon went astray. In the 1970s, “Global Cooling” was touted as the big danger, with a “Coming Ice Age” cover on Newsweek, and “Big Freeze” and “Big Chill” covers on Time Magazine, with “global cooling” articles in the science section of the NY Times. Alas, global temperatures were rising, not falling, and the alarmists had to start over. They did much better with anthropogenic global warming, and are still pushing the warming agenda today, even though the data are still failing to cooperate. Science is cited by all sides in the debate, but scientists can be affected by political fashion, and can shape their research accordingly. History, however, is harder to manipulate. Jordan Peterson should have mentioned that for hundreds of millions of years, without human help, the Earth has been heating up and cooling down, for reasons unknown. We don’t know why the Ice Ages arrived, or why the ice melted. We don’t know why the fossils of temperate zone trees and animals are found today on Axel Heiberg island, inside the Arctic Circle, and we can’t really be sure how long ago these species lived. The wood in these supposedly million-year-old trees can be burned and carved, and “looks like the wood of trees that fell yesterday.” Beneath the sand and soil of Axel Heiberg are leaf mats that resemble the leaf mats found in modern forests. We don’t know why 85 orders of North American animals, from the saber tooth cat to the mastodon, were wiped out less than 10,000 years ago. We know there was a Roman warm period, a medieval warm period (Vikings farmed in Greenland) and a Little Ice Age, with lots of variation in between. Only today, however, do we see political cults trying to gain power by offering themselves as the only hope of stopping climate variation. Vote for us, they say, or we’re all gonna die! 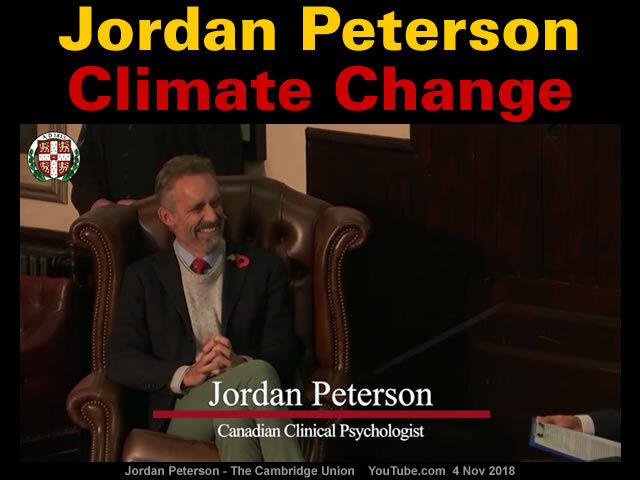 Jordan Peterson correctly recognized that the woman who was suggesting we all get together and save the planet from climate change was gently inserting a political foot in the door. Earth as a secular deity is powerful medicine, especially in the post-religious west. Those who wage passionate campaigns about climate and renewable energy, however, are not trying to “save the world.” They are trying to gain control the people who live here. Apart from the ideologies of ‘climate change’ do not underestimate the effect of change of heating fuels have had on both NY and London air as examples. Or the reverse effect in my locality in going for wood burning just for nostalgia. To the radio host talking about it I suggested alternative and healthier nostalgic option – going back to the chamber pot instead of the sewer connected toilet. Had a desired effect. On this I agree with CW though he is being a little disingenuous as I believe he believes, as I do that there are perfectly clear and obvious reasons for why the ice Age arrived, the fossils on Axel Heiberg and the Roman and medieval warm periods – namely that catastrophic upheavals and dramatic changes in the earth’s biosphere repeatedly happened throughout human experience and well into relatively recent recorded historical times. Indeed, Tim Cullen and this web site have done outstanding pioneering work in precisely documenting and publicizing the clear evidence for these events. nickreality65’s excellent comment highlights another crucial element of the “save the world” crazies on this. I have debated many of them, including Jill Stein during her presidential bid on, of all places al-Arabiya and am repeatedly astonished at their utter ignorance of all real science, especially chemistry and biochemistry, as Nick points out. Freud and Velikovsky would have both clearly understood the psychological dynamics driving the fantasy that “we” as a species are responsible for climate change. This creates the comforting myth that it is within our power to change it, whereas if the real cause is fluctuations in the ambient energy generated by the Sun – or variations in cosmic energy flows ultimately governing the Sun’s energy output as clearly established by Ralph Juergens nearly half a century ago, then as the planet-trapped, surface-dwelling tiny species we are, there is nothing we can do about it. A harsh reality for many to face indeed. Thank you: A revealing insight into the (lack of) commitment of the current Swedish government to dispassionate, open and fair discussion of the Climate Change issue.